On May 1st, Derek Whitis’ Freedom Autosport team – featuring veteran Grand Am Rolex driver Tom Long – will set out from their Florida home with just one goal in mind: to bring home the 2009 TireRack Cannonball One Lap of America (presented by Motor Trend) winner’s trophy. That added power – from Nissan’s stock 480 hp to over 800 at the crank – comes courtesy of Switzer’s P800 performance package that adds upgraded turbochargers, custom intake assemblies, 900cc injectors, a pair of Switzer’s MONSTER intercoolers, and Switzer’s custom software calibration, and exits through a unique Freedom Autosport-developed lightweight exhaust system. All that added power is only one aspect of Freedom Autosport’s total package, however. 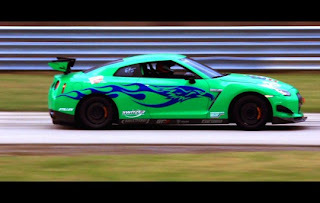 The signal-green GTR makes extensive use MIT-developed of active-aero components from AeroMotions, as well lightweight carbon body panels from Password:JDM, while components from Performance Friction & Motorsport Brake Specialists, Stillen, GT-RR.com, Forged Performance, Kraft Nissan of Tallahassee, NAGTROC.com, WillAll Racing, and JRZ suspension help the car stop better and turn nearly as hard as it accelerates. The 2009 running of the TireRack Cannonball OneLap of America (presented by Motor Trend) kicks off May 1st at TireRack headquarters in South Bend, Indiana and wraps up 8 days and 3200 mile later, again in South Bend. Will the Freedom Autosport/Switzer GTR break Porsche’s string of six consecutive OneLap victories and bring home the gold? We’ll find out soon enough. For more information about this legendary race, visit http://www.onelapofamerica.com.